Singapore may be a small country, but what it lacks in size it makes up for in ground-breaking architecture, welcoming and enthusiastic locals, a vibrant and diverse culture, and deliciously exotic cuisine. There is a huge selection of things to do, see and explore in Singapore. If your time here is limited, scratch beneath the surface of this extravagant and intoxicating destination when you try any of these adventurous things to do in Singapore. This bizarre yet mouth-watering dish can be (quite literally) a handful, but it is likely to be one of the most memorable meals of your trip. 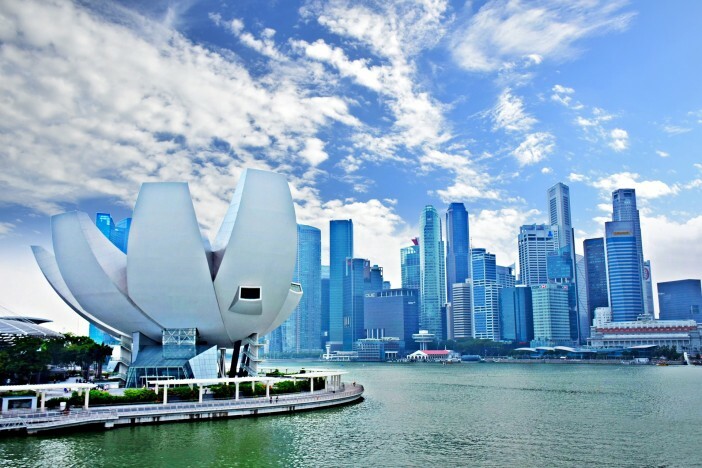 Head to Marina Bay and take your pick from the innumerable restaurants along the waterfront, where you’ll find tanks filled with crabs and lobsters of varying sizes. Decide how hungry you are before choosing a suitable crab. The resulting meal features a gargantuan crab served whole, coated in a thick, sticky, spicy sauce. You’ll be provided with all the implements to crack, pick, and otherwise demolish the crab’s outer shell to get to the succulent meat inside. Be warned, it can get very messy! We recommend leaving the cream shirt on the ship. Singapore’s world-famous futuristic landscaped gardens can’t be missed. The mystical and fantastical gardens are a marvel of modern horticulture, landscaping and architecture, and a tribute to Mother Nature. Wander through dense foliage in the Cloud Forest, explore wild jungles in the Heritage Gardens, and discover the wonders of a perpetual spring at the Flower Dome. But the gardens’ most amazing feature is, without doubt, the SuperTree Grove – uniquely designed vertical gardens which comprise of more than 200 plant species, and tower up to 50 metres tall. You can walk along the OCBC Skyway to get close to the edge, and admire an incredible aerial view over the whole expansive network of gardens. The famous bar; the infamous drink. No trip to Singapore would be complete without sampling a Singapore Sling, and the best place to find one is its birthplace – Long Bar at Raffles. This opulent yet laidback bar is a charming combination of elegant wooden furnishings, hypnotic wicker ceiling fans, and crushed peanut shells which coat the intricately mosaicked tile floor. Savour your world-famous, refreshing pink cocktail, and enjoy the unique experience of tossing the peanut husks on the floor just like the locals. It’s the only place in Singapore where littering is not only permitted, but accepted as part of the bar’s tradition! Singapore is a melting pot of cultures, and this is plain to see when you visit one of the many Hawker Centres – food hotspots where you’ll find delicious and inexpensive dishes from around the world. Singaporeans take their food seriously and aren’t afraid to push the boundaries. Sample Chinese, Indian, Malaysian, and even ‘Western’ meals from all manner of rowdy and enthusiastic vendors. One the most incredible things about Singapore is its skyline. Although it can be difficult to fully appreciate the sheer scale of the many towers and skyscrapers unless you’re up high. Luckily, Singapore boasts a great selection of rooftop bars to do just that. 1-Altitude Bar is Singapore’s highest sky bar (and the highest al fresco bar in the world), boasting 360° views over Singapore as well as great live music, DJs and cocktails. Possibly the world’s most sophisticated treehouse – SuperTree bar is set in the centre of one of the futuristic tree structures within Gardens by the Bay. Lantern at Fullerton Bay Hotel offers unobstructed views over Marina Bay and the impressive surrounding towers. Plus, the lavish bed-style seating is perfect for lying back and admiring the skyline. If you want to enjoy an adventure in Singapore, why not visit as part of a great Cruise1st Australia cruise deal? Browse the full collection online, or call our friendly sales team on 1300 857 345.